A lot of sweat, a few tears, and only a little bit of blood (we’re happy to say) have paved the road for these competitors. RCRD’s charter members are dedicated to their training and their teammates. If you’re ever in the mood to have your heartstrings tugged, find a speaker, play some Peaches, and watch the magic: roller derby has evolved beyond skate-out songs, but Boys Wanna Be Her has become more of an anthem for The-Little-Brutes-That-Could. Strong, Smart, Together! 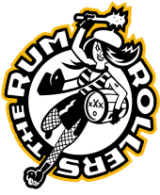 This competitive travel team routinely practices with RCRD’s charter skaters, and the tenacity they bring to the table is unparalleled. Tough of spirit and pure of heart, watching them play will leave you inspired. Teamwork usually makes the dream work, but this team of Queens can mostly be counted on to take leave of their senses over a good song and dance. Calculated and sharp as tacks. If you happen to find yourself tongue-tied in the presence of one of these talented athletes, just play it cool and ask them about their cats. Knowledge and skill development set a solid foundation for the players on this rookie team. Intro to Derby graduates are given the opportunity to push their individual limits at a comfortable pace, and can expect to find a better understanding of the rules and strategies along the way. OLoP is the pride and joy of RCRD; we love our beginner skaters! The skaters of RCRD have wills of iron, and it takes a truly special group of referees to corral them. 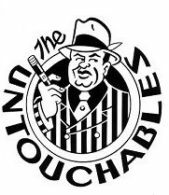 Not only do the Untouchables bring law and order, they are patient and friendly and passionate about roller derby; any respectful question regarding penalties and rules is guaranteed an equally respectful response. Good referees make for good skaters, and RCRD would be less without them.